With 18" carbon fiber rods and microShoulderPad, the DSLR camera can be easily carried over your shoulders. Using a handlebar rod clamp, you can attach the 2 hand grips to the standard 15 mm rods for perfect support and maneuvering. The microBalance Plus provides a vertical accessory plate for mounting microBalance counterbalance weights or other accessories to standard 15 mm rods. It consists of a rod clamp, a left-right adjustment block, and a cheese plate. With the rod-clamp having thumb screws, you can securely attach the microBalance Plus unit to 15 mm standard rods of camera support systems. Using the left-right adjustment block, you can optimally adjust the position of the counterweight to balance your camera system. The cheese plate offers mounting holes for Anton Bauer or Sony v-mount battery plates. Two counterbalance weights are included to balance the rig on your shoulder. 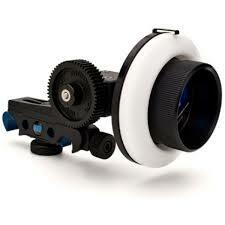 The microHandle Plus is an upgraded version of the microHandle and is used as a top or side handle for a camera rig. 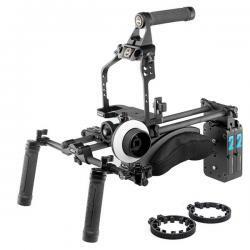 It comes with an integrated hot shoe clamp for directly connecting the handle to the top shoe mount on your DSLR camera. Industry-standard rails can be attached to the handle via mounting holes for mounting further camera accessories.